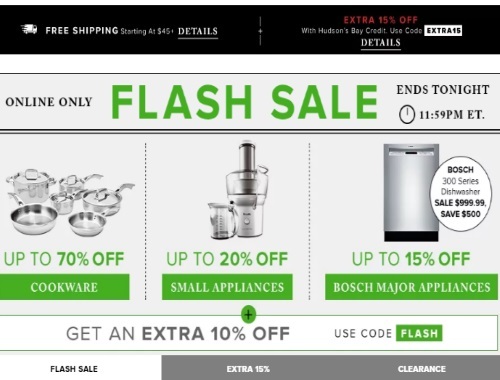 Hudson's Bay has Flash Sales today on a bunch of items! Save up To 70% off Cookware, 20% off Small Appliances, 15% off Major Appliances! Plus get an extra 10% off on top of the flash sales with the promo code FLASH at checkout. Offer is valid online only today until 11:59pm ET Sunday, January 22 2017.